Son dies circa 1931-the couple separated soon after. Called “Lise” in her will. German #1 for much of the 1920s in an era when Germans were barred from international competition. Won German Chmps from 1920-26. Austrian Champ 1923-26 Streak as German Champ ended by Cilly Aussem in 1927. 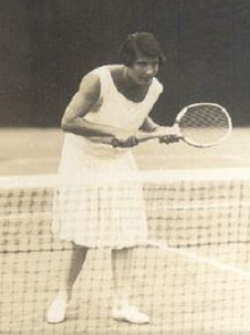 Famously hit the mother of Cilly Aussem in 1928 after Mrs Aussem accused her of “hypnotizing” her daughter to win matches. Aged 39 in 1933, she was still good enough to be ranked at #3 in Germany. As a Jew her family chose to emigrate to Switzerland and later England (by 1938) rather than remain in Nazi Germany. In England she was a coach at Seldon Park Hotel during WWII. Tennis in Deutschland von den Anfängen bis zur Gegenwart, 100 Jahre Deutscher Tennisbund, Berlin 2002 (this gives 1963 as the DOD). I also had a DOD of December 1963. Ancestry.com, however, gives July-September 1962 as DOD via its death index. Last edited by Rollo; Jul 25th, 2017 at 01:04 AM.